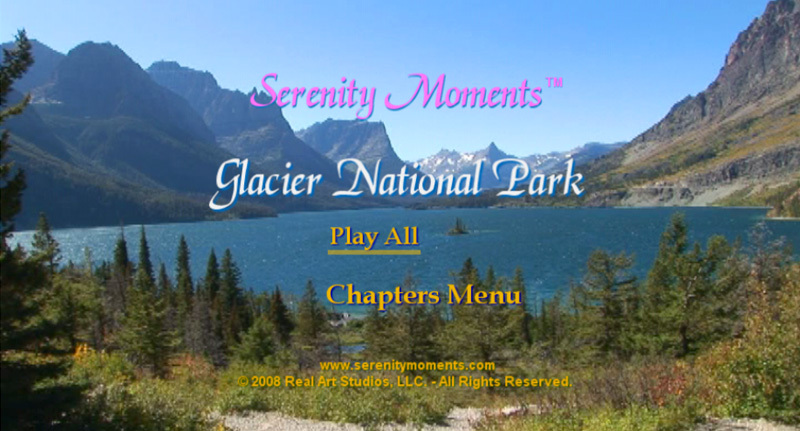 Serenity Moments ® offers scenic relaxation videos produced by Real Art Studios featuring serene and beautiful locations filmed in high definition video. The Glacier National Park relaxation DVD is now available on widescreen DVD (All Regions) and Blu-ray disc. 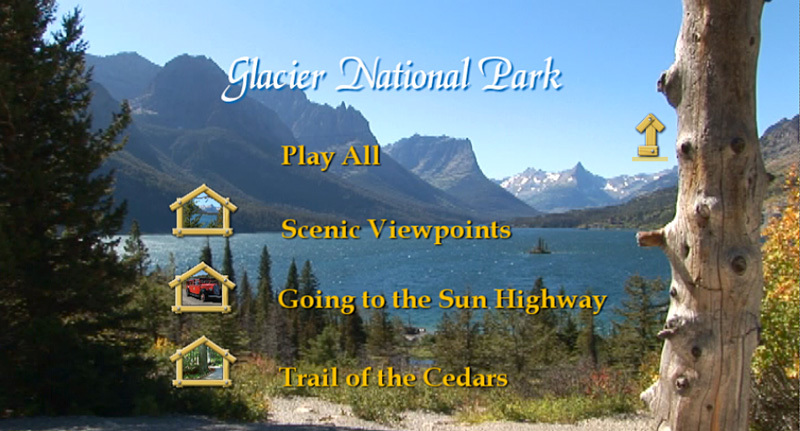 This new scenic relaxation DVD features spectacular scenery filmed in HD enabling you to enjoy a virtual vacation in Glacier National Park as if you are really there and will lull you into a state of deep relaxation. 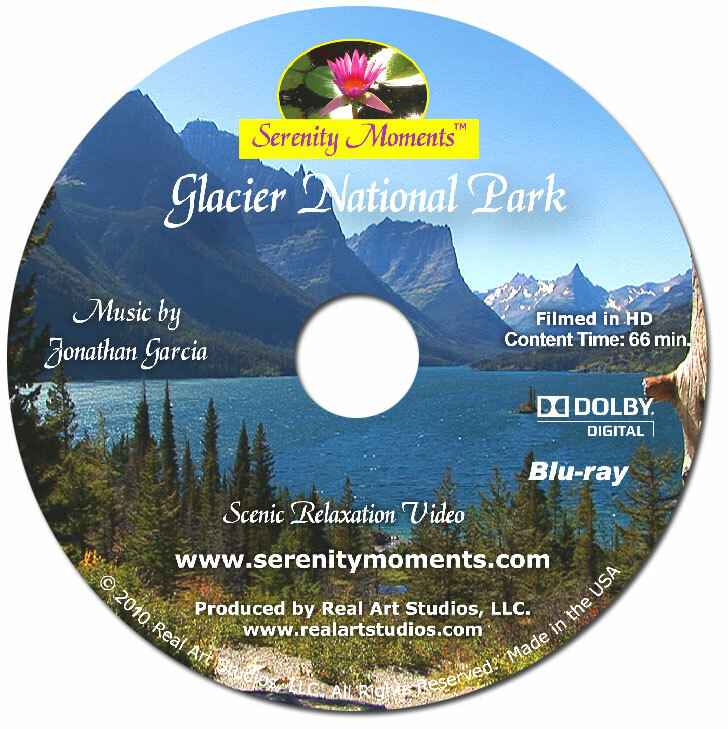 The Glacier National Park relaxation video also includes soothing relaxation music compsed by a talented young composer named Jonathan Garcia. It also includes ambient nature sounds and Alpha and Theta brain wave frequencies—a clinically proven method of helping the brain to enter a deeply relaxed state. If you practice yoga or meditation, our scenic relaxation videos will help transform you quickly into a very peaceful and enlightened frame of mind. As you view the exquisite detail of the beauty of nature captured in HD you will feel deeply relaxed, refreshed and rejuvenated in your mind, body and spirit. This beautiful relaxation DVD is perfect gift for those seeking stress relief, insomnia or patients who are recuperating from illnesses or surgery. Designed to help those challenged with PTSD, our videos are the ultimate relaxation experience for anyone who desires stress releif. Continued use of the product will facilitate brain entrainment, i.e., training your brain to remain in more relaxed state for extended periods of time which can result in recovery from the symptoms associated with post traumatic stress disorder and other anxiety related illnesses. It will also help you cope better with stressful events in your life. Brain research has indicated that relaxed brain wave frequencies can help strengthen the immune system and aid in healing from a variety of illnesses. Your emotional and spiritual health is vital to your physical well being so be sure to nurture your mind with our scenic relaxation videos. 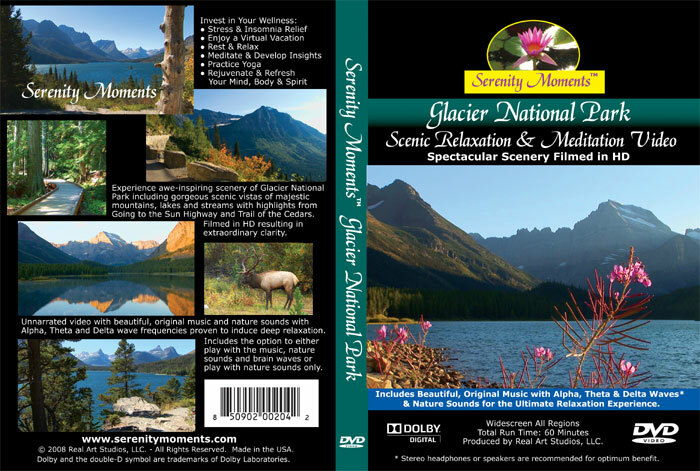 Our scenic relaxation video titles available on DVD and Blu-ray disc include the Alaskan Wilderness, the Canadian Rocky Mountains, Glacier National Park, the Hawaiian Islands, Kauai Dreams, Big Sur, and Italy. 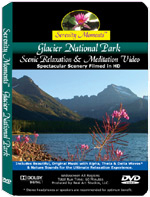 The Serenity Moments meditation and relaxation video series is a perfect tool for those practicing Mindfulness Meditation which has been clinically shown to be effective for the management of stress, anxiety and panic, chronic pain, depression, obsessive thinking, strong emotional reactivity, and a wide array of medical and mental health related conditions. Our product has been hailed as a major medical intervention by a leading clinical psychologist in early clinical trials and with continued use makes an ideal brain entrainment tool and healing aid. 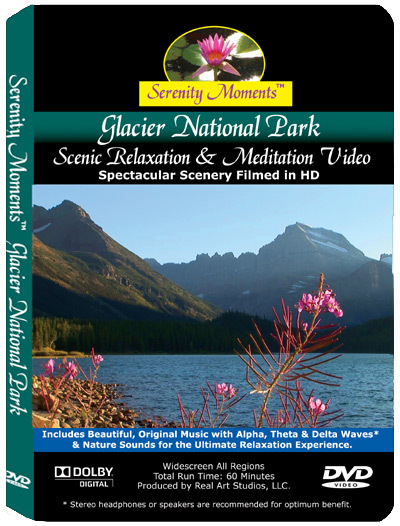 This relaxation video is also available on Blu-ray disc. Brain researchers and neurophysiologists have discovered that with continued use the brain becomes entrained into remaining in this relaxed state. When the brain is in Alpha or Theta wave states the brain increases the production of serotonin which is an extremely beneficial neurotransmitter that facilitates mental and physical relaxation. Slower brainwave frequencies such as Alpha and Theta waves produce endorphins that make you feel better for a natural "high". With continued use, the brain can actually create new neural pathways, heal the physical body and boost your immune system as well as help the mind learn easier. Our deeply relaxing meditation videos will enable one to calm the mind allowing the user to develop deep insights by making it easier for the conscious mind to access the smarter subconscious mind. Brain researchers have also declared that the subconscious mind is smarter than the conscious mind by a ratio of ten million to one. Thus this product will be a huge benefit to those who wish to tap into and harness the brilliance of their subconscious mind and well as help those who are suffering from stress, trauma or depression or those who desire a virtual vacation. To learn more benefits of Alpha and Theta brain wave therapy visit 4mind4life.com. Discover the secret to success by accessing your subconcious mind while relaxing on a virtual vacation with our beautiful videos. Working smart starts with a relaxed mind! If you would like to carry our product in your retail store we would be happy to put you in touch with our distribution company. Please use our Contact Form to get in touch with use or contact us via phone at (503) 521-9004. * Alpha & Theta wave frequencies help to synchronize the left and right hemispheres of the brain enabling the mind to function in concert as well as help induce deep states of relaxation. To experience the benefit stereo headphones are required. © 2011 Serenity Moments ® - All Rights Reserved.